A beautiful sunny day, so Caroline and I set off for the Haresfield topograph (next hill along from Haresfield Beacon). We take the ‘low road’ across the fields to start with, planning to return via the ‘high road’ through Standish Woods. This gives a rare opportunity to view (and photograph) the splendid old specimen oaks of Standish Park Estate in low winter sun. There are lots of these ancient stag-headed trees, mostly in field centres rather than margins, which gives away their origins as parkland rather than boundary trees. Standish House is now part of Standish Hospital – and has been for decades and the parkland is now enclosed, but these trees hint of past glories. The status of the hospital, just vacated by the NHS (see blog for 2003) is unclear, though we understand it will stay in health use (and there are a few peacocks left, despite fears outlined in last year’s blog). We are concerned about the trees though – as most are in severe decline and some are now falling. I know nothing about the Estate’s management regime, but must assume they are sympathetic to these trees simply because they are still there! Perhaps the estate are following best practice guidelines for ancient trees, and recognising their landscape, historical and nature conservation (lots of rare wood-boring insects) value. Or perhaps they just like them. The fields are wet and muddy, as is the lower part of the ascent – one step forward and half a step back through the steep sheep pasture. 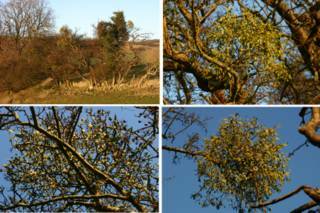 But I speed up as I can see a group of hawthorns with Mistletoe just on the edge of the enclosed area. This low winter light is wonderful for mistletoe and I want to get there before the sun drops too much. This is a typical small mistletoe colony at the edge of its normal tolerance – above this (modest) height it won’t grow here, on the exposed Cotswold Escarpment. There are about 6 decent-sized plants in the hawthorns, plus a few tiny ones. But in hawthorn even decent-size is small compared to apple, poplar or willow. A good mix of male and female too – the male obvious because of the lack of berries but also because of the slightly larger flowers, just opening out now. Christmas Eve at last – and I can be sure that after tonight mistletoe queries will reduce dramatically – not that I don’t welcome them, but it’s always a relief to have a break after a mistletoe-filled November and December. It’s not just me, Caroline agrees with this as well (probably more so). The mistletoe madness starts today at 0730 hours, with the postman delivering a large box. Still in bed, and with the house-alarm set, I’m not entirely a respectable figure dashing to the door, but I s’pose nothing shocks a postie. The package is the Lachenal china (see previous blogs) and I’m keen to unwrap it – it’s just like Christmas! After lots of polystyrene and bubble-wrap I finally get my prizes, and cracked and chipped as they are I’m v pleased to have them. Back to bed and next jolt is at 0750 – my mother rings to ask had I been watching? Er, no. I’d apparently just been on BBC TV Breakfast News talking about the bugs that live on mistletoe, but I’d missed it. No matter, I knew what I’d said – I was there when it was recorded… But good to know it was on – there was a possibility it was just going to be on News 24 and so inaccessible to most people I know (including us here – no digital TV coverage for Stonehouse – we should get a reduction in licence fee…). And then the Royal Mail at the door again! This time with a mistletoe print from ‘The Graphic’, an illustrated London paper. This is a famous picture from the December 1876 edition, all the way from Canada, courtesy of Ebay. Pleased to have it, slightly saddened it’s yet more evidence these old papers are simply being cut up and sold as individual sheets, but I bought it so mustn’t grumble. Though I spent some time perusing a print stall at an antiques fair in Moreton-in-Marsh yesterday, and whilst tempted by the prints displayed did get put off by the idea they were effectively dismembered books. And then they call AGAIN! A third postie and third van – not v efficient (?) but it is Christmas and I recall from my stints as a temp postman (c 1980, 81 and 82) that it is pretty busy down the sorting office. This time it’s yet another Ebay win – I won’t go into details but its a pack of mistletoe-branded er, romantic stuff, from Tennessee. Mistletoe stuff from Canada, France and Nashville, all within an hour, not bad. Just time to relax a bit before a scheduled call from BBC Radio Glos at 0830. About mistletoe of course, and the current media pre-occupation with the bumper (‘record’ if you believe the media) harvest this year. But no prob and happy to help. And now no mistletoe for ages (and can nip down the Co-op to get breakfast) – well, until 1015, when I do a scheduled call to Radio Essex. this one is more interesting, as they have a local wholesaler on the line who’s recently been over to France to harvest material, and Matt Shardlow from Buglife talking about the invertebrate life of mistletoe. So Matt and i do a sort of reprise on the BBC TV piece from earlier, and the wholesaler chap (Bill) talks about what makes good saleable mistletoe. But before I do, I’ve just found out that BBC Radio 4 You and Yours programme covered the Tenbury Mistletoe Market today – and also a piece on a French importer at New Covent Garden Market in London. I contribute a bit (natch) too. To listen point your browser at the beeb and follow the links through to Radio 4 and You and Yours or go direct to the You and Yours page. If visiting today you’ll find it on the ‘listen again’ link – if later try the last 7 days link and pick Tuesday (not sure when they update this – might be whole weeks in which case ‘Tuesday’ might be last week until this weekend – if you see what I mean). 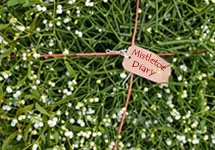 The mistletoe item is from about 9.30 minutes through to 17.30 minutes. Yesterday I made another attempt to acquire some decent mistletoe art nouveau material. This is a common occurrence for me, and usually ends in failure, though I have had minor successes. Yesterday’s episode (between returning from the druids and going to church) was typical. I bid for some Lachenal crockery that was up for auction on Ebay. Now ‘crockery’ is a bit rude, but that was effectively what it was advertised as being – as the Lachenal name was not mentioned in the descriptions. As all ebayers know, the way to sell is to include key words somewhere in the description, preferably in the title – and these lots had missed it out. And no one had bid at all – and just 15 minutes to go. Perhaps I should put all this in context a little – mistletoe, especially in France and Germany, was widely used in Art Nouveau imagery and patterns, and there are many high quality mistletoe examples – ranging from cutlery and tableware, through pressed glassware bowls and chandeliers, not to mention all the jewellery, cigar boxes, vesta boxes and pens, sewing kits etc. For some examples go to my main website and click through to the Art Nouveau page (start with mistletoe in art). Now this stuff is highly collectable, and some is extremely valuable – particularly the Lalique and Daum bowls and vases. You can always find examples in auction catalogues, and of course on Ebay. Don’t just search on mistletoe – include Mistel (German) and Gui (French) – but beware ‘Gui’ will give you lots of other stuff too – so be prepared to search through a lot of returns or learn how to construct your search selectively. I keep a watching-brief on all this stuff online, and now and then try buying – if it seems cheap (I don’t even try for early Lalique – prices start in the £1000s). 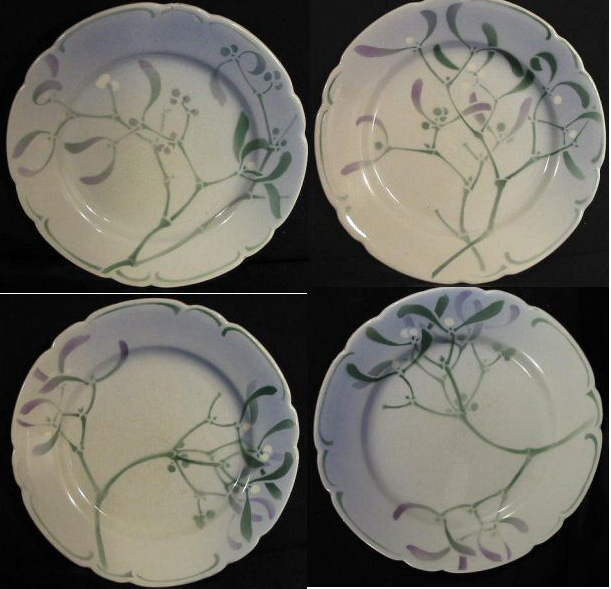 The Lachenal dinner service is a famous example of the genre, made especially appealing by having a differing mistletoe pattern on each plate/dish. They were a service made for readers of the Annales Politiques in 1896 An incomplete service was sold online recently for several hundred pounds – but the examples from yesterday were just 6 individual items, each listed separately by a seller in France. Without quoting the Lachenal name there was just a chance the usual collectors hadn’t noticed the sale. There were 4 perfect dinner plates, matching, but as is typical of this service, of differing designs (see pic – click to enlarge), plus a chipped serving platter and a discoloured lidded serving dish. With no bids they were all going for about £6 each (a bit more for the platter). A perfect opp I thought to acquire a fragment of this wonderful mistletoe service – so I bid for them all at 15 mins to go, and at 10 mins to go was looking to win all. But Ebayers like to keep a close eye on their desires, and I was pipped to the post in those few minutes by 2 others on the plates, leaving me with er, the chipped platter and the discoloured serving dish. I obviously wasn’t the only one keeping watch. A pity – the plates would have looked so good in the china cabinet… maybe next time. And I am pleased with the wins – which being already damaged can accompany me on mistletoe talks (I always take a boxful of mistletoe exhibits) without worrying too much about further damage. So that’s alright then… A picture of the winnings will be posted below….